As with anything you do, there are risks, and this holds true for trading currency on the foreign exchange market. Simply, the foreign exchange enables investors to take profits, or losses, from buying foreign currencies at a low point and selling them at a high. The main risk component is that, due to political conflicts or other national friction, your stock could collapse and not rise back up — creating a loss. In this article, we’ll go over some of the main risks you’ll need to understand when forex trading in order to reduce them and reduce your losses. When you’re trading currencies on the foreign exchange you should be continually working on your loss control and refining your risk management methods. Doing this will strengthen your investment portfolio and keep losses as low as possible as well as protect your savings or investment capital. A major component of risk management is making entirely sure that you don’t invest more than you can afford to lose. Transferring a large portion of your investment capital, or savings, into a currency you believe is a surefire win is reckless. Forex trading is unpredictable and risky at the best of times, so investing more than you can afford to lose is dangerous and can wipe out all of your earnings in just moments. In the same scope as risk management is moderating your use of broker leverage. Basically, broker leverage is a loan that a broker provides to an investor to use as capital for their investments on the exchange, but as with any and all loans, you’ll need to pay it back, or earn it back. The issue with broker leverage is that if you over borrow and use the funding on a currency that drops in value, then you’re left in debt, often hard-to-pay crippling debt. Going beyond purely financial risk management, there’s also the management of your own emotions during your time trading. This means not being impulsive when there are price drops or gains. If a currency falls in value don’t immediately sell off every single one you own, either partially sell 10% to 15% to reduce losses, or don’t sell anything at all. Typically the highest returns are in the long game, don’t sell at the drop of a hat. In order to be a successful forex trader you need to focus a large portion of your energy and mind towards risk management, it’s essential. Not only to keep your investments stable but for your own wellbeing. The best way to plan this out is to ensure you have a plan in place before you begin trading and do as much research on the volatility of each currency as you can. Remember, a currency’s history doesn’t tell it’s future, but it can sure help you make informed decisions. As stated above, margin risk or broker leverage risk needs to be in your scope at all times when you’re trading. There can only really be two main outcomes when trading, profit or loss. Invest more and the profits are higher, but so are the losses if the market goes down. In forex trading, your trade or investment amount is leveraged when it is enhanced by borrowed funds, whether they be from your broker or anybody else. A leveraged trade is most often used when an investor believes that there is great profit potential in a currency, and they don’t necessarily have the money to invest, or they don’t want to use it, so they turn to their broken for leverage. Typically a broker will allow leverage sizes of up to 100:1, though new traders and even experienced ones shouldn’t take advantage of the entire amount in the event the current values plummet, leaving you with not only zero profit, but major debts to pay off. One of the more dramatic risks you will have to watch out for is political volatility and economic instability. As the forex exchange encompasses almost every country in the world you’ll have a lot of information thrown at you on a daily basis. If this information is negative it has the potential to make currencies unattractive investments and severely stunt your profit possibilities. Times that are the most likely to have a major effect on the worth and investment attractiveness of a forex currency are typically elections, both planned and unplanned, as well as international relations. This means that before investing in any currency, you should always check with a nation’s elections and their potential candidates. A major key aspect you must look out for with government changes are the policies of the new leadership. Things like trade, taxation and more can greatly sway currency pricing for forex trading, both directly and indirectly. With that said, allied nations undergoing leadership change will more than likely see currency values sway in accordance with each other. Although these changes and events are almost impossible to predict, it would be wise for forex investors to do some due diligence research prior to large investments in a currency. A great idea is to either create or find a political and economic calendar with information on your chosen currency’s home country. This can include things like electron dates, previous swings in forex currency values and even whether there are expected rises and falls in your currency during the end of financial years or government surplus and expenditure reports. Having news alerts switched on via your smartphone will also give you a heads up to when issues arise, potentially giving you insight into a buying opportunity. On top of this, a nation’s interest rates will be charged based on the borrower’s risk. Country’s that are seen as higher risk, will be changed far higher rates than those who aren’t. This means that if you’re planning on investing in a country’s currency you should take a look at current interest rates from central banks. These banks are often the ones whose actions determine whether a country is attractive for investors or not. This is particularly important as countries rely on companies setting up shop in order to prop up their economies and improve tax flow. If interest rates are too low or too high this will affect the attractiveness of the nation and reduce this tax flow and have an impact on the currency value, something you want to watch for. Your best bet for monitoring a country’s financial status, and the risk factor, is monitoring major central banks and their monetary movements within a country. This means when you spot a central bank propping up interest rates higher than typical levels it can mean that the country is being seen as a little risky, and therefore will affect your currency values. The most important thing to take note of when correlating central bank interest rates with forex trading is that the higher a country’s interest rate, the higher the exchange rates. Interest rates will almost fall in line with exchange rates and have a major impact on your investment if the sways are too high. Another good tip to remember is that higher interest rates will make your forex investment grow organically. So, if a country’s interest rate is high, or higher than usual, your investment will grow at that rate, but you must make sure that you sell before the interest rate reverses. This type of forex risk is mainly limited to businesses who operate in multiple countries and pay their employees in different currencies, but also for corporate investments. Typically, the exchange rate risk will hit a business when the currency they have a large stock of becomes worthless in their base or ‘home’ currency. Similar to what happened in Zimbabwe in the early 90s, this risk becomes exceedingly serious when a currency’s exchange rate falls against the local currency of a business, or investor. You may have invested $5,000 in a foreign currency, and even if the value in the foreign country climbed, the final exchange rate in your home currency could wipe out all profits, and even the original amount itself. It’s best to stay alert and well aware of exchange rates during your entire time investing in a certain currency as the final exchange rate will ultimately determine whether the forex investment is profitable or not. Volatile markets are ones which have major swings in price, growing exceedingly fast then falling far and growing once more. This, however, doesn’t mean a currency is bad per se, just that traders need to develop a process with which they implement to reduce risks. Typically volatility is seen as bad, and something to stay away from, but there are often high profits to be made within a volatile market. To make the most of a volatile market, do your best to stay calm and don’t be impulsive. Purchase at a low point and monitor value swings and don’t sell all at one price point. Staggering your sell-offs in these markets is your best bet at minimising risk and reducing your total losses or increasing your total profits. 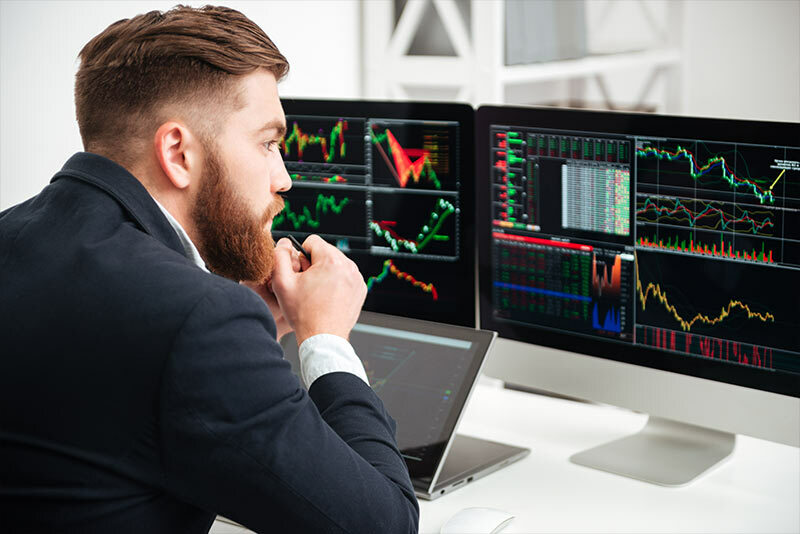 As volatile markets are typically a result of large media stories and other events, its best to keep an eye on the news and set up alerts for the currency you’re investing in. This will ensure traders don’t become anxious when values begin to fall and they sell off immediately, as there is most likely a lot of growth to come, and impulsively selling at a low will cut any profits you might have made. Purposeful devaluation is one of the biggest risks when forex trading is concerned as there is little that can be done on anyone’s part to prop the value back up. If your base country has devalued the currency of your investment currency then it’s almost permanently worthless. Typically these deviations happen during times of conflict between countries and can come about as a result of sanctions or other governmental policies. In the past devaluation has been implemented to block trading or either make trading fairer. In both circumstances, it can severely damage your investment returns. There are also knock-on effects during a devaluation which can cause further monetary damage, and that can be the explosive rise of interest rates implemented to control inflation which will further decrease the value of your investment. In these circumstances, it is typically recommended you either sell to get any funds back, or hold out and wait for the long term. If you’re a forex trader or a prospective one, your due diligence procedures should definitely cover whether a currency is at risk of devaluation and whether there are interest rate risks present in the near future that could damage your investment. Central bank press releases, government policies, and the general news should give you enough of an insight into current relations to make an informed decision on whether it is a good idea to invest in a currency or not. If you’ve made a successful bet as a forex trader, and your investment grows substantially you expect to be able to sell off and be paid the amount you’ve earned. When this doesn’t happen as it should, it’s called credit risk. It happens when a third-party, either your broker or a firm is unable to provide the funds you’ve made, either due to overspending or falling into bankruptcy. As a forex trader, you should ensure that you do everything in your power to reduce the risks of being affected by an unstable firm or broker. This means making sure to check that your broker or their firm is licensed and follows rules and regulations in place. Also speaking with previous clients and checking online for reviews is a good idea. A few things you must check to mitigate your chances of dealing with unpaid investment returns are making sure your broker is regulated in accordance with the country they operate in, as well as making sure that they have a large reserve fund amount to cover losses. With all of the above said, in order for you to become a successful and smart forex trader you should make sure that you have a good understanding of not only the big risks but all of the smaller ones too. Overlooking anything could leave you with major losses, in debt or entirely broke. Failing to correctly factor in the risks involved in trading will almost always have dangerous repercussions and leave you lost for what to do when difficulties arise. All of the risks listed above should have at least a minor action plan developed so you can find the best ways to avoid or reduce them.